Today, I’m digging way back into the road trip archives to bring you a vintage write-up from October 21, 2005. 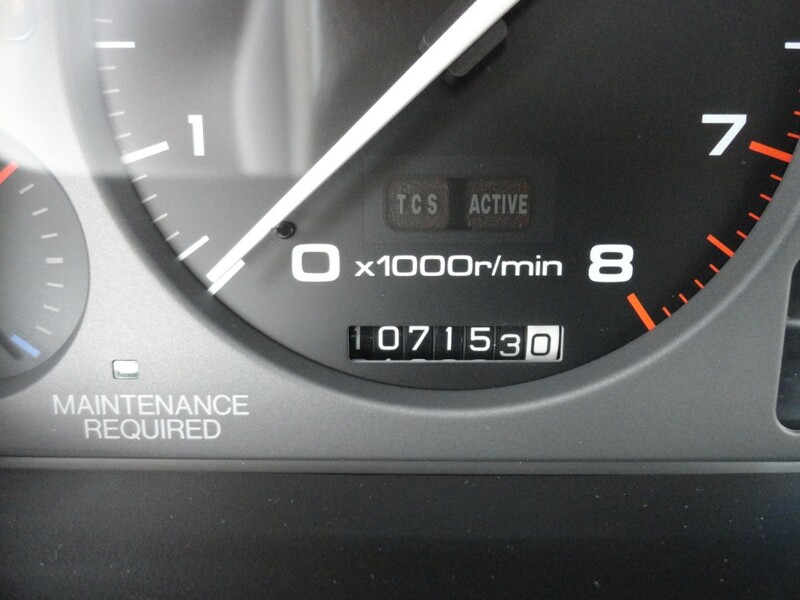 My Legend had “just” 194,392 miles on it at the time. I set out in the (very) early morning hours to experience a famous highway. 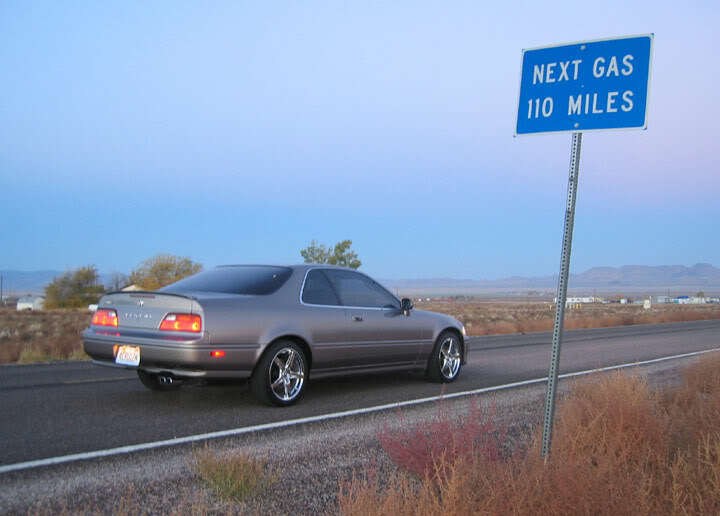 Following is a post that I shared with the Legend forums nearly 10 years ago, and I still remember that road trip like it was yesterday. This morning I traveled to Rachel, Nevada. 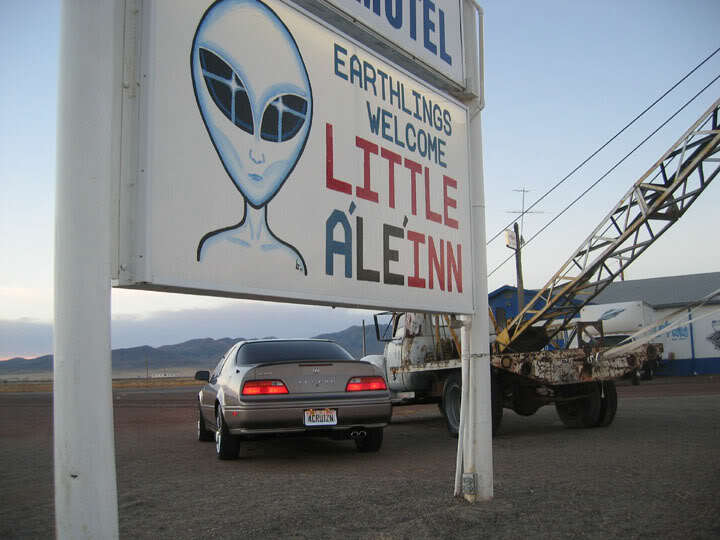 The town is the closest you can legally get to Area 51. The round-trip was 400 miles. 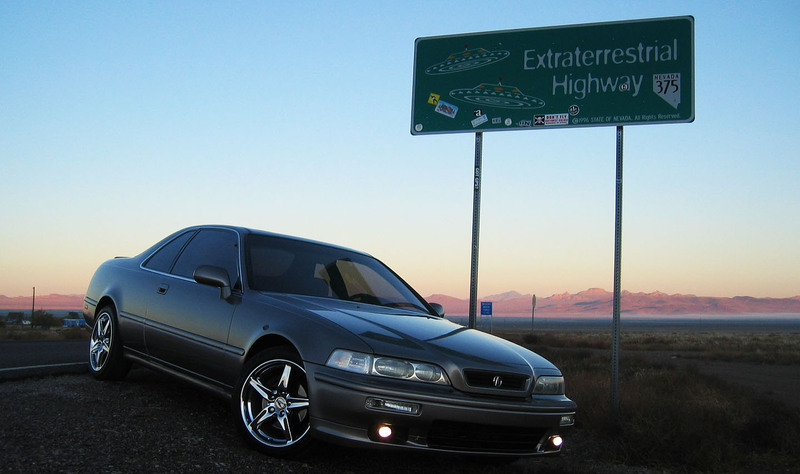 Rachel, Nevada takes us to a small town 110 miles from Las Vegas, site of a formerly secret US Air Force installation known as Area 51. The base develops new planes such as the stealth bomber. 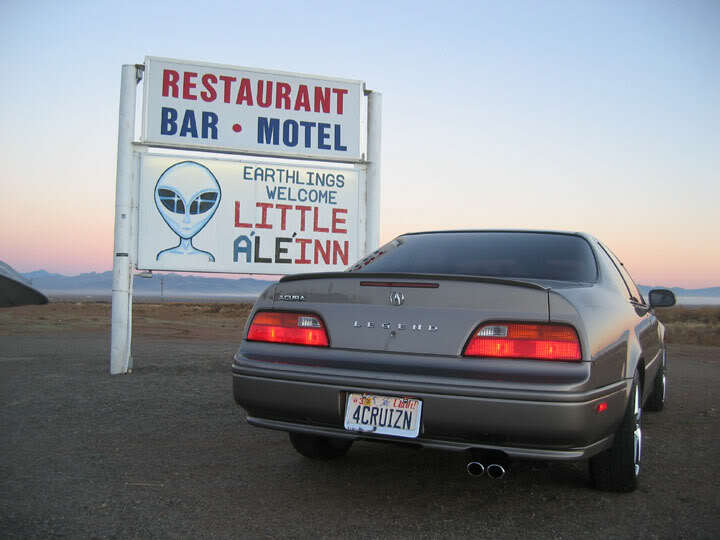 The secrecy shrouding Area 51 has given rise to suspicions over the years, earning the town of Rachel (primarily a collection of trailer homes) the title “UFO Capital of the World,” and Nevada State Highway 375 “Alien Highway”. The film focuses on the everyday people of Rachel, once left alone to service the military, now the center of tourism and a publicity boom. There are enough stories and photos to persuade even the most die-hard skeptics that something extraterrestrial may be going on. There’s not much to take pictures of. 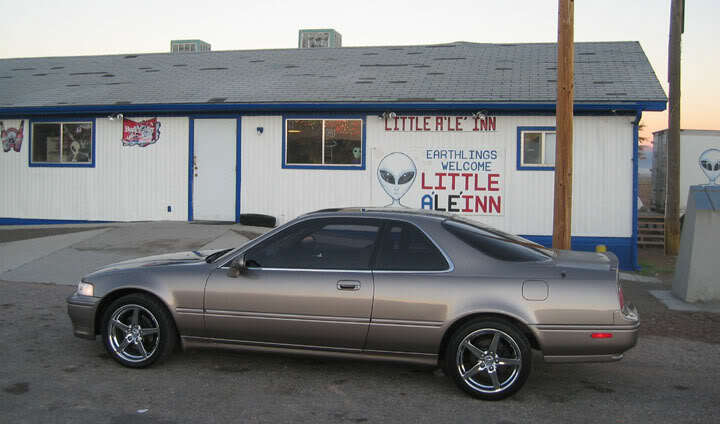 There is the ever-famous “Little AL-E-INN” that I had to get pics of. 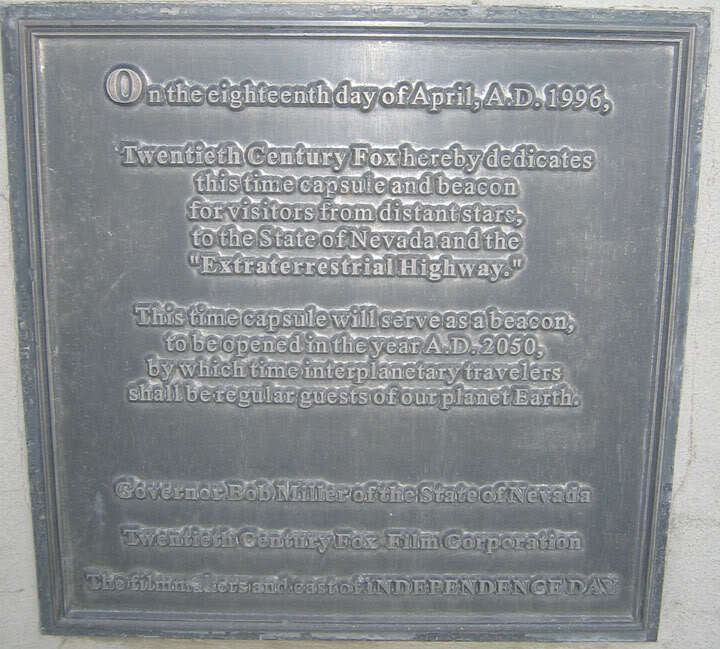 And then there are the Extraterrestrial Highway signs which are pretty cool. I forgot to get a picture at the gas station, but it only had one pump and only 89 octane. On to the pics I did take. I used the same backgrounds a lot because I didn’t have much else to work with. No gas for 110 miles! 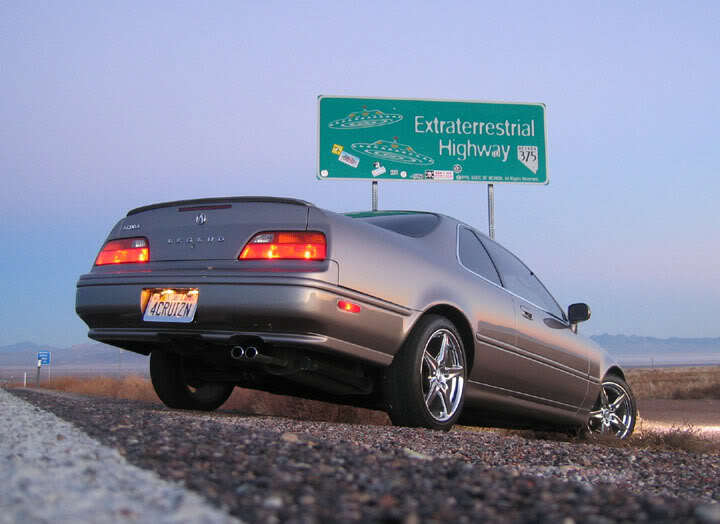 Population: Humans – 98, Aliens – ? I wonder how much a room at the A’Le’Inn costs. LOTS of open space without any people, buildings, or anything! And of course, I did park there! 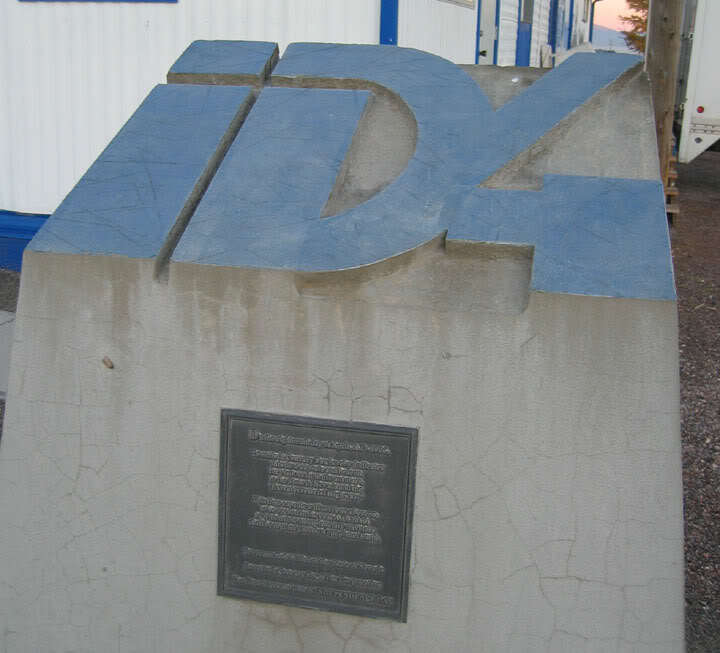 When the movie Independence Day was filmed in 1996, they put a time capsule in front of the A-LE-INN. Here’s the placard and monument. 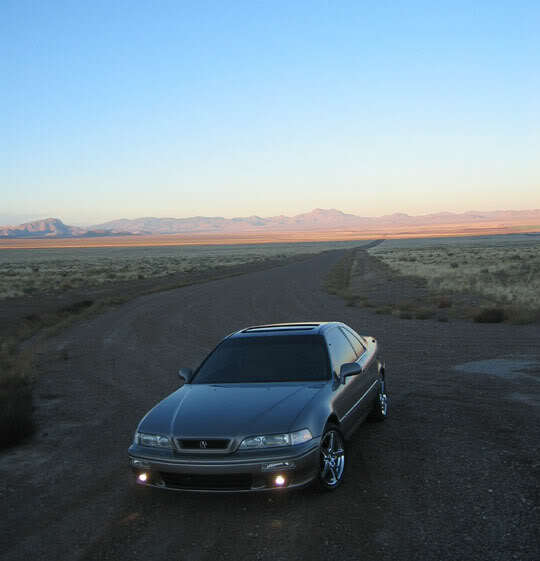 The next picture is (according to my map) one of the dirt roads that leads to Area 51. Had I gone any further, I would have been approached by armed security guards in Jeep Cherokees, and probably fined $600. On a related note, is anyone out there looking for a “500k-miler-in-training”? I’ve got a couple of nice options for you. 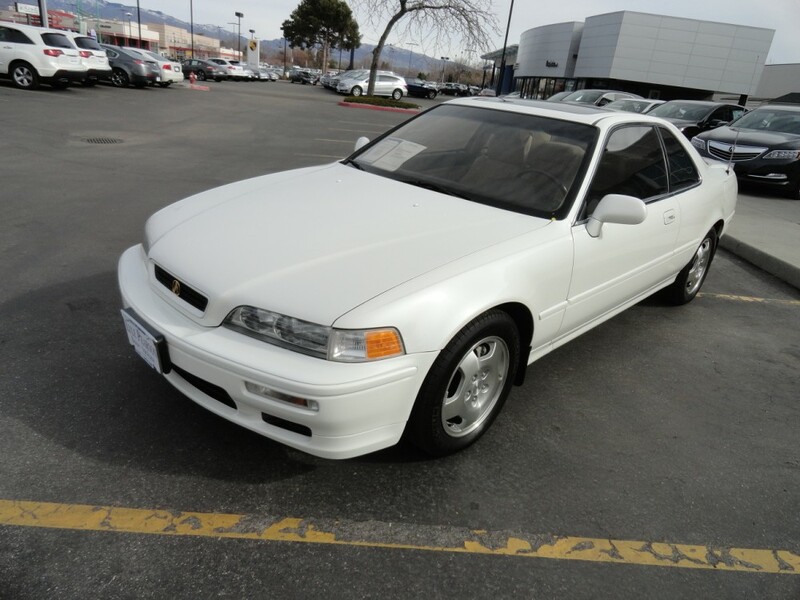 First up is this absolutely pristine one-owner 1995 Legend LS coupe automatic in rare Cayman White Pearl with only 107,000 miles. My friend Josh from TSX Travels gave this one a look-see for us and took the below 3 pictures, as well as many others which I posted here on the Legend forums. 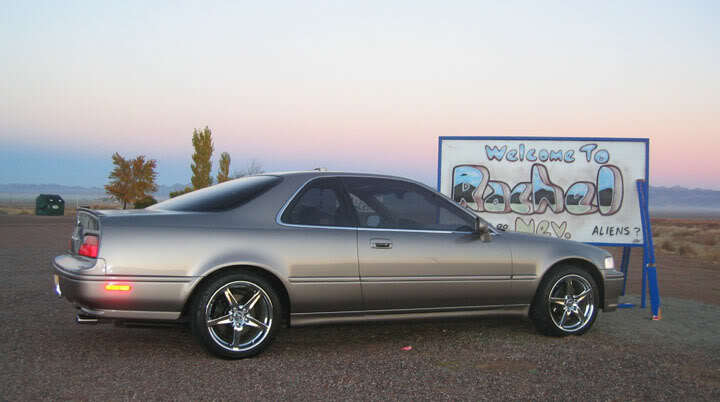 The other option is this “twin” car to mine. 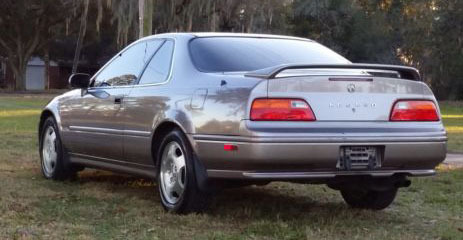 It’s a 1994 Legend LS coupe 6-speed in Desert Mist Metallic. It’s got a clean title and is only halfway broken in at 226,000 miles the odometer. Ebay shows the current bid at just $2,000. 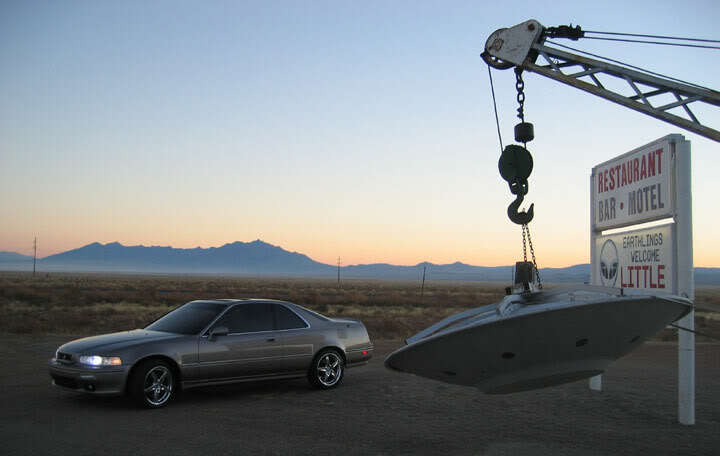 Check out this awesome 6-minute time-lapse video of a cross-country drive from Hollywood to DC. Thanks to my friend Ian for sharing it. 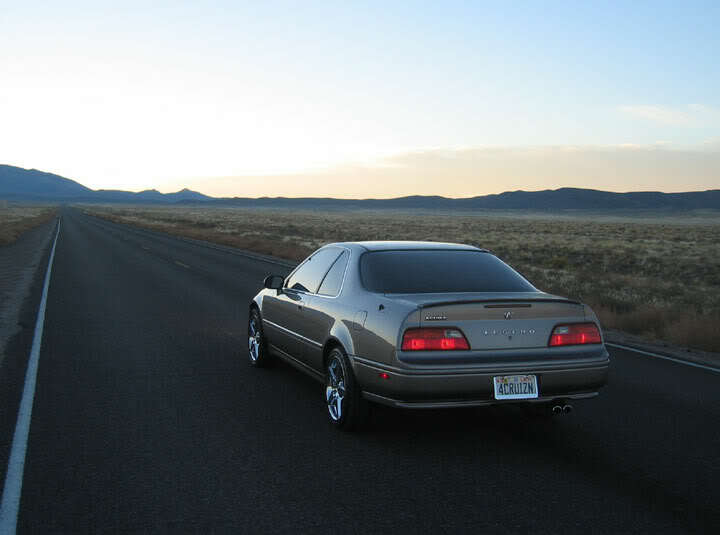 This entry was posted on February 20, 2014 at 6:05 am and is filed under Legend, Nevada, Road Trip, Throwback. You can follow any responses to this entry through the RSS 2.0 feed. You can leave a response, or trackback from your own site. The white one’s in Boise, Idaho. Easy drive from Lexington, KY! Come and get it! Yeah I’m watching the twin on Ebay – gotta see what that baby ends up going for. 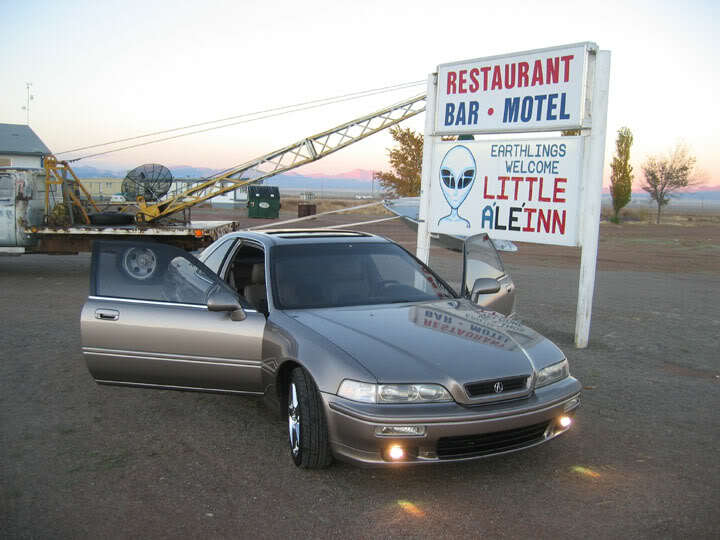 I’d like to make the drive on the Extraterrestrial Highway and make the trips twords area 51. Heck it might even be worth the $600.00 fine just to see just how far you could make it. It would be quite the story to be able to tell thats for sure. 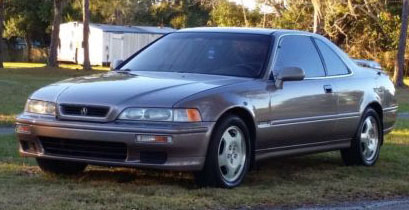 I’d like to see that white coupe as a manual just to see what it would bring. I know! 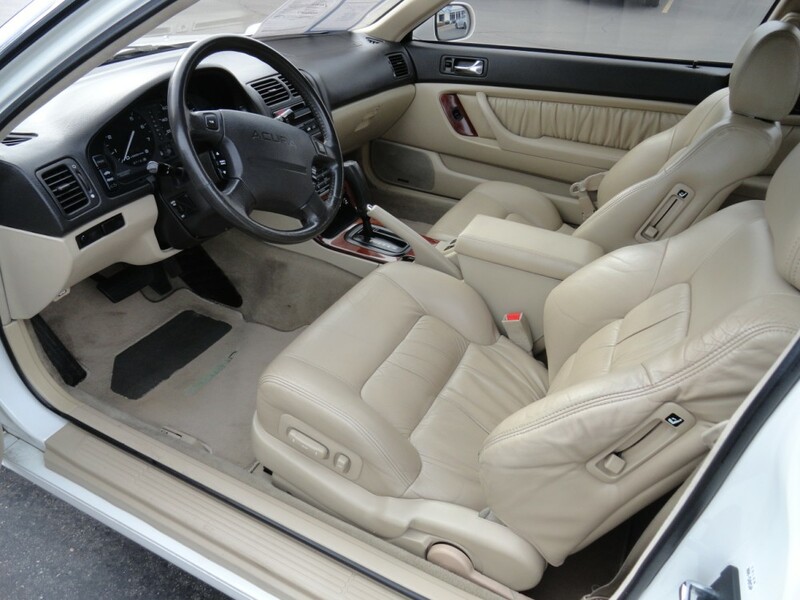 I can only imagine how much more collectible the white ’95 would be if it was a stick shift. One of these days I need to get back to southern Nevada and see what’s left of the Rachel area. 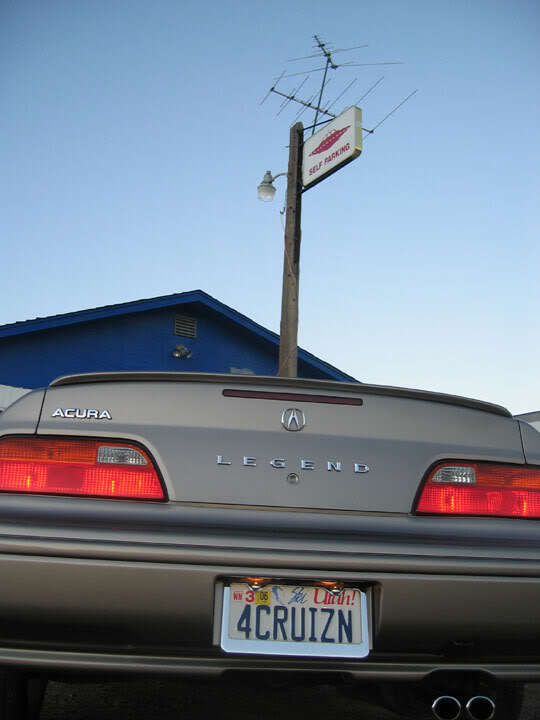 I wonder if/how the A-LE-INN stays in business. Maybe I’ll stay there sometime.